Same Active Ingredient and Effectiveness As FRONTLINE Plus For Dogs at a better price! Effective on fleas, ticks, and lice. Kills Flea Eggs and Larvae. 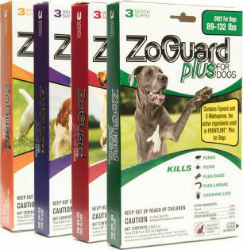 ZoGuard Plus remains effective even after bathing, water immersion, or exposure to sunlight. 3 Dose included in package – Each dose is effective for 4 weeks. A total of 12 weeks protection.